Two hydraulic jack designs are available from HWH – the straight-acting and the kick-down. Stuart's Service will help determine which type best suits your customized application. The HWH straight-acting jack provides extra stability with its large-based footpads and strong vertical structure, while the HWH kick-down jack allows for extra flexibility – important if the motorhome should be moved while the system is engaged. 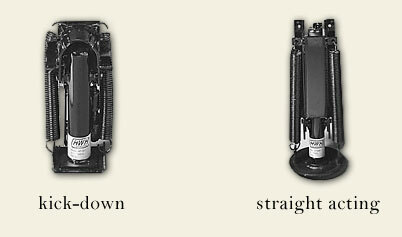 (Note: the straight-down jack does not fit some motorhomes).